Here we are on the eve of the biggest sporting event in the world, Super Bowl 50. 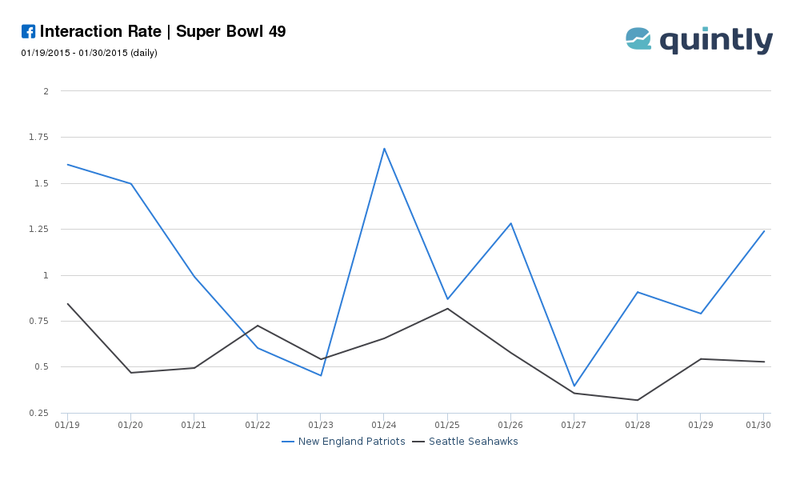 Last year, I wrote about how I used social media benchmarking tool Quintly's Facebook data to predict the Patriots as the winner of Super Bowl XLIX based on the interaction rate on the Seahawks and Patriots Facebook pages. 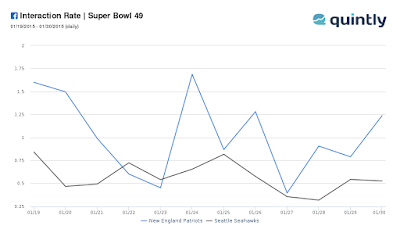 Based on how the Patriots' Interaction Rate that last Friday before the Super Bowl, I thought the Patriots would win it. So, here I go again this year, back to the Quintly well to see who it predicts will win Super Bowl 50. 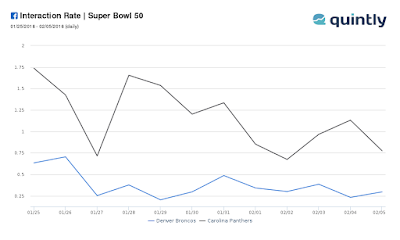 Using my same methodology as last year, I looked at the Facebook Interaction Rate for the past 12 days for the Broncos and Panthers. 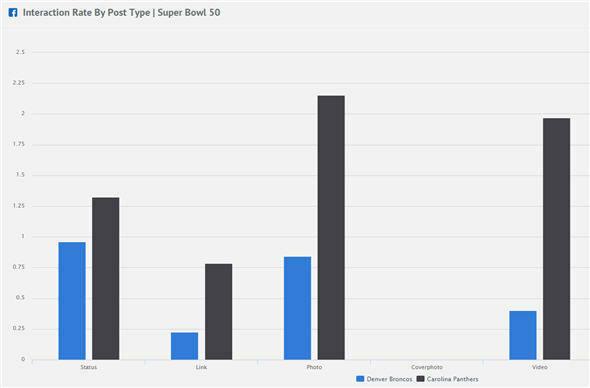 Analyzing more closely what might be causing the higher Panthers interaction rates, it's not due to a few photo or video posts. It's quite common for a post to get 2000 or shares, while the Broncos usually see only hundreds. 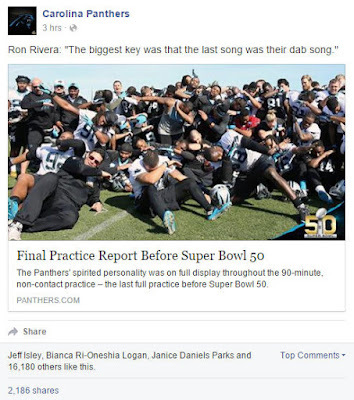 In fact, the Panthers Facebook fan base just seems more engaged overall. Maybe it's because they are coming off an amazing year, QB Cam Newton is a rock star, or all those free football giveaways to kids after a touchdown is generating tons of goodwill! While I would love to see Peyton Manning win one more Super Bowl before he retires, it does not look likely. 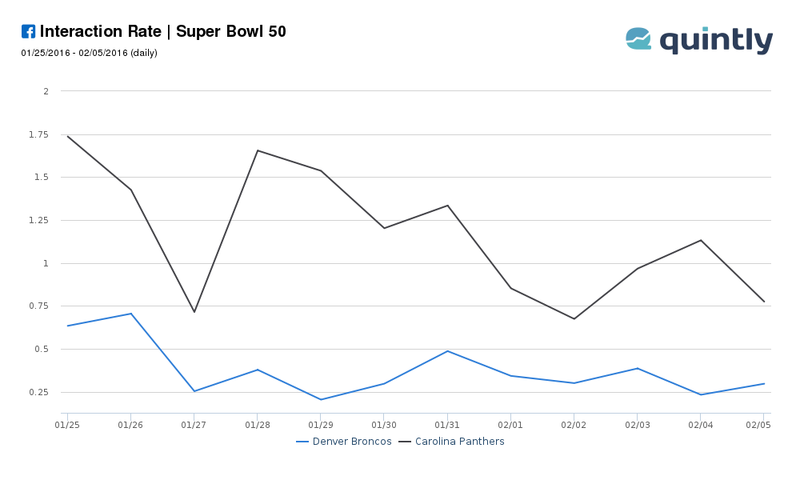 Based on this analysis, the Super Bowl 50 winner will be the CAROLINA PANTHERS.